We're closing out September with a bang and a fun weekend excursion. We're headed to Houston and I'm taking my girl to her first concert - Taylor Swift! I'm not sure who is more excited... Okay, it's me. What are your big plans for this weekend before welcoming the arrival of October on Monday? If you're looking to get away, maybe you'd like to come to Austin. If so, I think this would be a fabulous place to stay on Lake Austin. I love what they did with the place! Maybe you will find yourself decorating for fall this weekend. If so, here are some tips to help the process along. 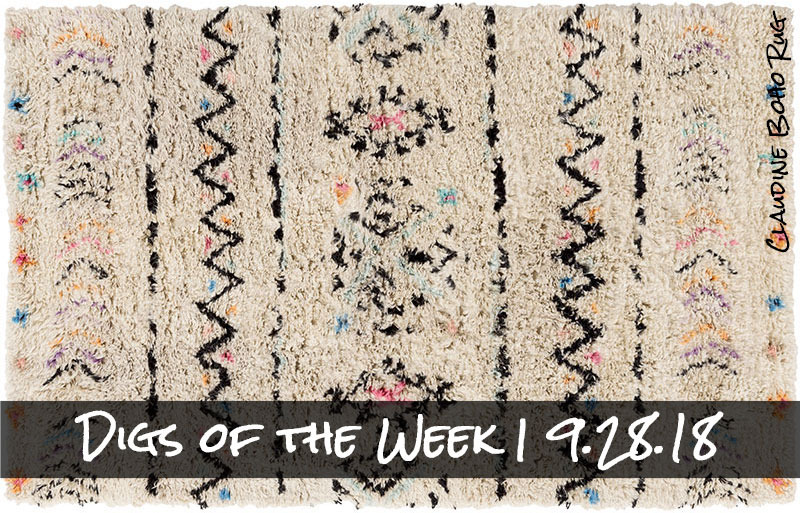 Our Claudine Boho Rug (pictured above) would make a lovely addition to your home this fall. This soft shag rug would really cozy up your space. This gorgeous high-rise apartment in downtown Manhattan gives off a serene vibe while being in the middle of the bustling city. That sectional is calling my name! Have you seen Busy Phillips' pantry? Weird question, I know. But take a look here and tell me it isn't a sight to behold. Finally, I'd like to end on a sweet note. Peek inside this chocolate cottage. It's like something right out a fairy tale.